It's a lousy time to be a record label. Profits are tanking, bands are angry—OK Go just ditched EMI—and YouTube and BitTorrent changed the game. Still, some labels are transforming themselves to help musicians in the digital age. "Change or Die" may sound like hyperbole, or an idle threat, but for the music business, the two alternatives have never been more real. EMI may very well go extinct in the coming months, and all of the major labels are fighting losing battles. But all is not lost. But that's definitely not the case now. Record stores are dying at an alarming rate, and fewer and fewer people are buying CDs every day. It's safe to say that the current generation of teenagers has never perused record stores as a normal activity; it's all downhill from here for physical music sales. And FM radio isn't doing too hot either. In short, everything that the music industry has known to be true for the last few decades is quickly turning to dust. Big labels can still bank on country, R&B and pop acts, but the bottom has already fallen out on alternative groups and other internet-friendly genres. And that's just the beginning. Manufacturing and distribution used to be the cornerstone of a label's business; every major label owned its own plants to make the albums and also dealt with shipping the albums worldwide. Today, only Sony still owns plants that manufacture CDs, with the other three big labels outsourcing manufacturing to them. But they all still have reps who have to go out to record stores and make sure that their albums are getting proper shelf space. They have to deal with defects and returns. There are lots of resources required to deal with the manufacture and distribution of a physical product, but that physical product is quickly headed towards irrelevancy. The biggest music stores are now virtual, so there's no need for someone to go gladhand every Sam Goody manager so they give you endcap space for Use Your Illusion II. The iTunes Music Store sells 25% of the music sold in America as of last August, and that number is definitely going up, not down. 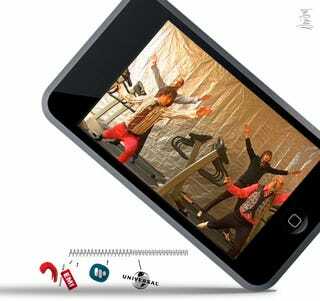 According to the IFPI, physical sales of music dropped 15.4% globally between 2007 and 2008. But in that same year, digital sales rose 24.1%. And Nielsen SoundScan numbers show that the number of units sold between 2006 and 2009 rose from 1 billion per year to 1.7 billion per year, with a unit referring to either an album or a song sold. It's a significant increase, but when someone buying three songs counts the same as someone buying three CDs, you can see why the labels are losing money despite the positive-sounding stat. And TuneCore's internal numbers show that online sales are growing even faster for independent acts than those already well established. TuneCore CEO Jeff Price told me that between 2007 and 2009, TuneCore artists have gone from earning $7-8 million a year to $31 million, with $60 million in earnings projected for 2010. That's insane growth, to be sure, but it's got a long way to go before it represents a sizable proportion of global music sales. To put things in perspective, the IFPI recorded $4.9 billion in sales for 2008. Furthermore, these days it's easier than ever for musicians to record music without an expensive studio. Software such as Reason, Pro Tools and Logic can be bought for $300 or less, and run on a mid-range laptop. Cheap mics and gear can be found all over eBay and Craigslist. Tie everything together with a $200 to $500 mic preamp analog-to-digital/digital-to-analog box, and you have a mini-studio in your bedroom. Marketing and promotion, another cornerstone service that labels provide, has also been transformed by the web. You no longer need radio play and ads in Rolling Stone to get your band noticed. When a band makes a music video, there's less of a need for a major label with contacts at MTV to push it through official channels to get it noticed. These days, you can just throw it up on YouTube and get it noticed by some music—or gadget—blogs. The fact that it's a simple click or two from video appreciation to buying actual music is worth more than any paper ad in any dying magazine. EMI is bleeding money. Earlier this month, it reported a whopping $2.4 billion loss, which, when added to its prior debts, puts it $4.5 billion in debt to CitiGroup. It owes Citi $160 million this month, and it's facing a restructuring plan that'll require an additional investment from its parent company. EMI is owned by Terra Firma Capital Partners, a British private equity firm that also owns waste management companies, gas stations, residential home builders and movie theaters. To them, the art EMI is releasing is about as important as the trash that Waste Recycling Group collects. If it doesn't make them money, it isn't worth keeping around, 80 years of history or not. Billboard's Senior Editorial Analyst Glenn Peoples told me that it's not for lack of trying that EMI finds itself in this position. "Labels have cut as many costs as they possibly can, they've taken fewer risks, they've signed fewer artists and tried to make safer bets," he says. "They're doing what they can, but the revenue might not be there to support the way they do business. So it's very possible that the recorded music division of EMI will be sold off and will go elsewhere. An acquisition by Warner Music Group is a possibility, and that would take it down to three majors in recorded music, and that'd be pretty drastic and a lot of concentration between three companies." An EMI Music spokesperson told me, "EMI Music is doing well. We've reported revenue growth, despite a declining market, and strong operating profit and margin improvement, both in the last financial year and in the current year." But if they can't convince Terra Firma that they have a way out of the quagmire they're in, the possibility of the number of major labels to dropping to three is very real. Ra Ra Riot is a band from Syracuse, NY who's currently prepping their second album from indie label Barsuk Records. Barsuk is a true indie based out of Seattle, featuring bands such as Death Cab for Cutie, Mates of State, Nada Surf and They Might Be Giants in addition to Ra Ra Riot. I talked to Josh Roth, Ra Ra Riot's manager, about the reasons bands still have for signing with a label. One big positive that signing to a label provides a band, he told me, is giving them legitimacy. "I think right now with the internet, there are just so many bands out there that it's easy to go unnoticed," he told me. "There's still is a certain charm to having a label saying 'We like this band and we're going to sign them and you should take a listen.' With the amount of bands that are out there, it's hard to filter what is actually good now." Furthermore, as outlets such as radio and MTV have become less relevant, new venues for being heard and getting paid have opened up. "Commercials are becoming much more relevant," Ra Ra Riot guitarist Milo Bonacci told me. "That's how a lot of bands get paid or get their music out there. That's how a lot of people hear a song for the first time. I feel like commercials are taking the place of commercial radio." And to get on a commercial, it sure helps to be signed to a label with a nice licensing department. Of course, there are different types of record labels. A major label, such as EMI, has a lot more money to throw around and can make more promises, but contracts with majors can end up with artists further in the hole due to these deep pockets. As Bonacci told me, "There's more risk. There's more fuel to propel you forward up front, but that's no guarantee." That same fuel could blow up in your face. We've seen how bands who don't hit it big can end up "owing" their major label hundreds of thousands of dollars, after all. Indie labels (true indie labels, not boutiques under the umbrella of a major) have less resources and therefore will give bands less to recoup. Indies also will often offer the artist a chance to interact with top brass, something that is almost never done at a major. Indies are presumably owned by passionate music fans rather than gigantic multinational holding companies, which is important when a band needs to know that a label is 100% behind them, according to RRR's Bonacci. And signing to an indie instantly connects you to that labels fans, Bonacci says. 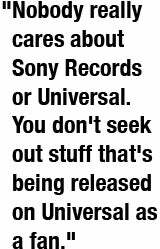 "Nobody really cares about Sony records or Universal. You don't seek out stuff that's being released on Universal as a fan. Independent labels, be it Domino or SubPop or whatever, those labels have fans." Indie labels seem to have a better chance of adapting and surviving in tumultuous times. Since for the most part they're private companies with few employees, they're able to make drastic changes in their business models much more quickly than major labels. But that doesn't mean they'll all survive; famed indie label Touch and Go closed down last year, and in addition to repping bands such as TV on the Radio, Ted Leo and the Pharmacists, !!! and Blonde Redhead, they also handled distribution for other venerable indies such as Drag City, Kill Rock Stars, Jade Tree and Merge. It was a huge blow to the indie label scene. But now some labels are pushing what are called 360 deals, which involve them in virtually everything an artist does. One of the most famous 360 deals was EMI's 2002 deal with Robbie Williams, which was worth a whopping £80 million, giving EMI a piece of basically everything that Williams touched. That didn't go so well, with Williams threatening to withhold albums from the label and trying to get out of his contract. But last week, according to UK trade paper Music Week, Williams' manager Tim Clark publicly came out in support of the embattled label, saying, "My own view is Citigroup would be mad at this stage not to keep EMI on as a going concern. It just would be bonkers." In any case, 360 deals and general diversification are what big labels such as EMI are looking to move into, according to Billboard's Glenn Peoples. "They're definitely diversifying and they're actually getting into agencies, artist management, concert promotion. There's really no area that the four majors are not pursuing right now." These deals make the most sense for huge acts with lots of opportunities for branding and licensing. You've seen it in action here on Giz, in fact, with Dr. Dre's Beats headphones and Lady Gaga's new Creative Director "job" at Polaroid. Both those acts are signed to Interscope, a sub-label of Universal that's clearly pushing artists towards these new revenue streams. But many smaller acts are still reluctant to give a label a slice of the entire pie with such a wide-reaching deal. 360 deals don't make sense for all bands; Ra Ra Riot manager Roth isn't sold on them. "A lot of labels are also now branching into management because the manager is involved with everything going on with a band. Labels will try to be like a full-service company to a band, but I don't think it'll be very popular." He worries that bands will be setting themselves up to be taken advantage of even more by labels if they give up merchandising and touring profits to them. Having an independent team working for a band and playing middleman between them in the label makes sure there's someone deeply involved in "business stuff" that still has their best interests at heart. And it makes sense that a manager would be wary of labels moving into their territory, but there's still a distinction between label and manager with these deals. "For example, a new artist signed to a multi-rights deal may use the major label's merchandise company and e-commerce division in addition to its publishing and recorded music companies," Peoples says. "In the past, a manager could pick and choose which merch, e-commerce, publishing and record companies it wanted to work with. Now they're more likely to be under the same umbrella." Sometimes, a band's management team can replace what a label does entirely. Just yesterday, OK Go announced it was splitting with EMI, whom they didn't have the greatest relationship with, to strike out on their own with a new company called Paracadute. Paracadute is basically OK Go's own team to handle management, promotion and distribution of their records. "The things that a major has to offer above and beyond anybody else are the things that OK Go really didn't need so much," Peoples says. "And that's radio promotion and access to brick and mortar retail. If you're going to create nearly all of your consumer awareness through cheaply made YouTube videos, you don't need this big promotional and distribution system behind you." But not all bands can do what OK Go has done. The digital world looks a lot more accessible when only viewed through the lens of rock acts. "If you're an R&B act, if you're a straight up pop act, a country act, you're going to need radio and you're going to need brick and mortar retail, and that's not going to change anytime soon. Things are changing definitely for alternative rock, rock and indie, but some genres sell a lot better in digital than other genres." But clearly, the money that's to be made in music is no longer just in album sales. And bands seem to be presented with a choice: they can either allow labels to become more involved in everything that they do, and give up money that used to go exclusively to them in the process, or strike out on their own. Either way, they'll entering a landscape where getting their song on Gossip Girl for 40 seconds is more important than any amount of FM radio play, where getting a music video posted to Stereogum is more important than getting it on MTV and where you make more money touring behind an album than selling that same album. And in order to prove to artists that signing with a label is a better idea than going out on your own, they'll need to make big changes; bigger than they've made so far. "It might be how an addict ends up turning his life around," Peoples says. "He's gotta hit rock bottom. And I dunno if the record industry has hit rock bottom yet, but maybe that's what'll need to happen for there to be really big change." But at the end of the day, the saving grace of record labels might be a lot more basic than who gets what percentage of merchandise or who deals with distribution. The big question is this: do bands really want to try to make it completely on their own? As Bonacci says, "I don't necessarily want to have all that nitty-gritty stuff to worry about. I'd rather just worry about making music. I don't want to worry about numbers or distribution or marketing or publicity or anything like that. That sounds like a desk job. I used to have a desk job, that's why I'm playing music. Now look at me. I sleep on couches."